Taipei, Taiwan – October 18, 2018 – AVer announces the release of the new C36i+ Intelligent Charging Cart . Charge smart and save time with the C36i+’s intelligent charging technology. 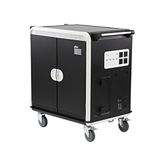 Capable of safely storing up to 36 classroom devices, the C36i+ is the multi-functional classroom tool that helps educators manage their medium to large sized classroom’s devices. The C36i+ comes equipped with AVer’s intelligent charging technology that selectively targets devices so they are charged in proper order, ensuring that classroom devices are always ready for use at a moment’s notice. 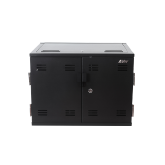 Large enough to store up to 36 devices, the C36i+ utilizes adjustable slot dividers and premium frictionless sliding shelves to provide educators and students easy charging access to any type of classroom device ranging from tablets and Chromebooks to laptops. With a built-in smart cable management system, the C36i+ completely removes cable mess from the classroom and makes retrieving or storing devices a simple, quick, and efficient experience for students in class. With newly improved Clip-in Dividers, cables are strongly secured in the C36i+ so teachers don’t need to worry about tangled cables. 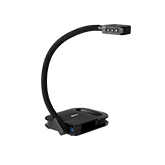 Adaptive charging allows educators to power additional classroom tools such as laptops, document cameras, or other digital classroom tools directly from the C36i+. 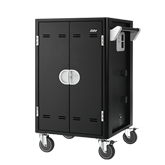 Bringing classrooms a premium charging solution to enhance their digital learning initiatives, the C36i+ adds an intelligent charging solution to a solid steel constructed charging cart with a secure 3-point locking mechanism to protect a school’s expensive classroom equipment. Once the C36i+ is locked educators can be at ease knowing that their learning devices are safe and secure. The C36i+ is the backbone of any flipped classroom and is the go to necessity for any school looking to implement digital learning into their curriculum.